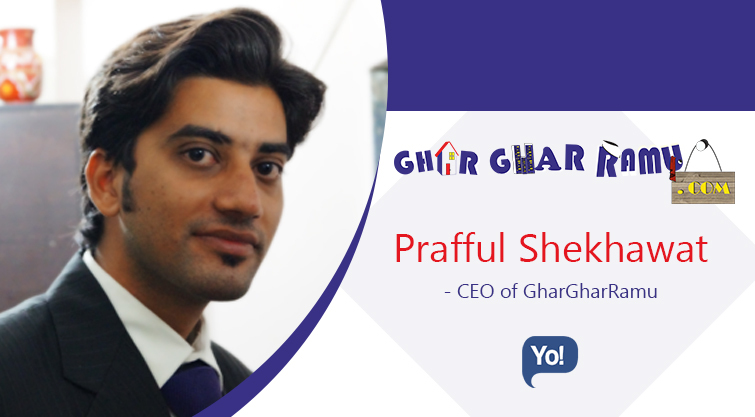 Prafful Shekhawat is a person driven by dedication and among millions who struggled, failed and surged ahead in search of success. He always had the aim to provide individuals an opportunity to earn in order to fulfill their needs and support their family. He wants to serve families throughout the world with products of the highest quality backed with a guarantee of satisfaction; to render a service to customers that are outstanding in its helpfulness and courtesy and to give full recognition to employees and Representatives. After completing his B.Com graduation, he went on to gain ample experience in the finance industry. Few years down the line he started to mull the idea of launching his own startup. He wants to share with others the rewards of growth and success and to meet the obligations of corporate citizenship by contributing to the well-being of society and the environment in which it functions. GharGharRamu is one stop destination service with safety measures, quick service and money saving as well. You can order whatever is required in your daily needs they deliver that product at your doorstep with no minimum bill limit. Do you remember that time when you need a medicine to ease your headache in the middle of the night? But since you don’t have any, you just have to bear the pain. In addition, when you have the cravings for delicious chocolate fudge ice cream but since you are unable to drive to that ice cream parlor as you are all alone in your house and you can’t drive (and we know, that’s the most frustrating feeling-EVER! ), there’s nothing you can do about it. But what if there’s someone who can do all that for you? What if we tell you that you just have to sit at your home and make a call to GGR (Ghar Ghar Ramu) and just have to wait for a moment to get what you need? We bet you would love to have that service at your door. In the service industry, the most challenging task is to find customer satisfaction that is what helps your business grow until your customer is happy your happiness is not long lasting. It is difficult to satisfy different kinds of people every single time. Time is the very prominent parameter along with quality in this sector, Whatever your customer’s demand is you have to fulfill it within time, no excuse. Whatever problems you face during this task you have to solve it in a fraction of minutes and go ahead. The solution is to keep your backup plan ready, for every single time. Till date we have not fetched any kind of investments, we fulfilled our requirements from our savings itself. the reason was to know the strength of our product, now that we are very confident of our product we are looking forward to it (Investments). Communication: Knowing what you want to be accomplished may seem clear in your head, Training new members and creating a productive work environment all depend on healthy & effective lines in communicating. Confidence: There may be days where the future of your brand is worrisome and things aren’t going according to plan. This is true with any business, large or small, and the most important thing is not to panic. Part of your job as a leader is to put out fires and maintain the team morale. Keep up your confidence level, and assure everyone that setbacks are natural and the important thing is to focus on the larger goal. As the leader, by staying calm and confident, you will help keep the team feeling the same. Creativity & quick decision-making: Some decision will not always be so clear-cut you may be forced at times to deviate from your set course and make an on the fly decision. This is where your creativity will prove to be vital. It is during these critical situations that your team will look to you for guidance and you may be forced to make a quick decision. As a leader, it’s important to learn to think outside the box and to choose which of two bad choices is the best option. We react very quickly to any situation. Success is a state of mind if you believe you are successful, you are. Not knowing your limits. Stretch your limits wisely with time. Overcommitment can get you in serious trouble. Maybe I would wear different clothes. We will grab opportunities dynamical we haven’t thought of these right now.